Pretend for a moment that you are one of the very lucky people on this planet who was born into extreme wealth. Not just millions, tens of millions or even hundreds of millions… Imagine that you've been given billions of dollars in cash just for being born. How would you spend that money? How would your spend the rest of your life? Most people would probably spend the rest of their life vacationing in exotic locations, flying from mansion to mansion on private jets without a care in the world! You know what most people wouldn't do? Use their unlimited time, connections and wealth to build the largest, deadliest and most powerful private army on the planet. Sounds like the plot line from a Hollywood movie right? Sometimes true stories are better than a movie, and this is the story of Erik Prince and his company Blackwater. Erik Prince was born June 6, 1969 in Holland Michigan, a city best known for its annual tulip festival and its large population of Dutch Americans. Prince's parents, Edgar and Elsa shared a Dutch heritage. Four years before the birth of Erik, Edgar and two colleagues from the die cast machine manufacturing company where they worked, founded their own firm, The Prince Company. The Prince Company set out to make small scale accessories for the auto parts industry and within a few years, business was booming. By the time young Erik was 4 years old, Prince Co. had hundreds of employees and multiple divisions. It's unclear whether the sun visor was actually invented by Edgar Prince himself, but he and his family were the main beneficiaries of an extremely valuable royalty that came with every sun visor that the company sold. And as the sun visor became a standard accessory in all cars worldwide, Edgar Prince made a fortune. At their peak in the mid 1990s, The Prince Company manufactured 20,000 sun visors every day. Erik was very close to his father growing up. During his formative years, the two would travel the world together, visiting famous WWII battle locations and even the Dachau concentration camp. These visits instilled the young Erik with a deep sense of national pride and desire to protect his homeland from ever seeing similar atrocities. For college, Prince was accepted into the U.S. Naval Academy, but dropped out after three semesters. Instead, he studied economics Hillsdale College, and worked as an intern in the George H.W. Bush White House. After receiving his bachelor's degree in 1992, he became a commissioned Navy officer and eventually a Navy SEAL with deployments to Haiti, the Middle East, and the Balkans. However, his SEAL career was cut short upon the death of his father in 1995. The 25 year old Erik was called home to run the day-to-day operations of the Prince Company. The following year, Erik and his mother decided to sell their family business to a company called Johnson Controls. Their price tag? $1.3 billion in cash. At this point, Erik Prince is 25 years old and sitting on a billion dollar fortune. Did he escape to the Bahamas or Hawaii to live out a life full of mamacitas and margaritas? No. Quite the opposite in fact. Within a year of the company's sale Prince moved to Virginia Beach and launched his very own private military company called Blackwater Worldwide. The initial purpose of Blackwater, which was was co-founded with a fellow ex-Seal named Al Clark, was to build the ultimate training and recreational facility for American military and police personal, active and retired. Their first major investment was a 6,000 acre piece of land in nearby North Carolina that would be used for special ops training. The facility was basically a school for SWAT teams, police, and other military units. Business was slow at first. Then, in 2000, after the attack on the U.S.S. Cole, the Navy was looking for someone to train sailors against terrorist attacks. Blackwater won the contract. After September 11, the company flourished, going from $200,000 in federal contracts in 2000 to $1 billion by 2007. The success has led some of Prince's critics to label him a war profiteer. Regardless, the government was using more and more private contractors for some of the things it used to handle in-house such as protection of diplomats and other private security. By the mid 2000s, Blackwater was the largest, deadliest and most powerful private army in the world. Unfortunately in 2007, controversy hit Blackwater when its employees, working under a State Department contract, killed 17 unarmed Iraqi civilians fleeing a car bombing. 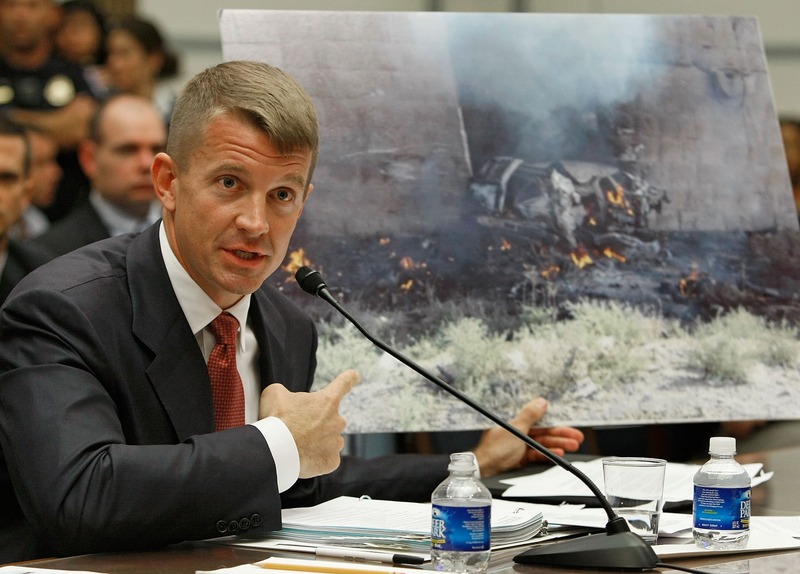 The House of Representatives called a hearing on Blackwater, where Prince defended the actions of his contractors. Defense Secretary Robert Gates wrote a memo to Admiral Mike Mullen questioning the use of private contractors in providing combat security training to the military. In December 2008, six of the Blackwater contractors involved in the shooting were indicted by the Justice Department. A few months later, Prince announced he would step down as Blackwater CEO, and a year later, he put the company up for sale. After the sale of the company to a group of private investors, Prince moved to the United Arab Emirates, where he is an advisor to the crown prince of Abu Dhabi. Today thanks to his family money and the incredible success of Blackwater during its heyday, Erik Prince has a personal net worth of $2.4 billion. In addition to his role in Blackwater, Prince has also served as part of a covert CIA task force. He's helped the CIA execute missions targeting al-Qaeda leaders and allies, and has helped the agency insert personnel into areas where U.S. intelligence is weak. In short, he has been operating as a CIA spy, as what Vanity Fair called "a Mr. Fix-It in the war on terror." His name was leaked to the press by the House intelligence committee. While Hollywood has made allusions to Prince-like characters who run Blackwater-like operations (see: Jon Voight's character in 24), no doubt there'll be a full silver screen send-up one day soon. Because Erik Prince — billionaire, soldier, family man, and spy — might just be reality's most interesting man in the world. Multi-billionaire entrepreneur, philanthropist, and sports team owner Richard DeVos just died at the age of 92. Here's how he earned such a large fortune.